PUTUMAYO NEW ORLEANS 2020 COMING SOON! The popular record label Putumayo World Music and Masala Expeditions (a division of insightCuba) invite you to explore Putumayo's home base of New Orleans, one of the world's most vibrant musical hotspots. Putumayo's founder and CEO, Dan Storper, and in-house ethnomusicologist, Jacob Edgar, will lead you on an exclusive, behind-the-scenes adventure through The Big Easy. The birthplace of jazz and the home to countless musical legends that have influenced and inspired popular music everywhere, this intimate and unique trip offers a once in a lifetime opportunity to discover the best New Orleans has to offer. Putumayo has used its local expertise and inside connections to curate an unforgettable overview of the city's cuisine, architecture, history, art, and, of course, music. After checking in to the French Quarter's historic Hotel Monteleone, we will gather at the Palm Court Jazz Café for cocktails and introductions, followed by a private meet and greet with legendary trumpet player Greg Stafford. Enjoy a dinner concert with Gregg Stafford’s Jazz Hounds, featuring singer Topsy Chapman, followed by an optional club crawl led by Jacob Edgar. After breakfast at the hotel, we will embark on a "History of Jazz Tour" with local music expert John McKusker. Lunch at the legendary Felix's Oyster Bar will be followed by a guided walking tour through the picturesque French Quarter, including stops at The Cabildo and the Jazz Museum at the Mint. Our French Quarter tour ends with a cocktail at the historic Napoleon House. Once we've had a chance to rest, we will explore the trendy Marigny/Bywater districts, on our way to dinner at local's favorite Elizabeth's. Then it is off to the funky Vaughn's Lounge for a private meet and greet with musician Corey Henry, followed by a concert with his band The Treme Funktet. Those with energy left are invited to join Jacob Edgar on another optional club crawl. Start your day with breakfast at the hotel, then drive to the Garden District, one of the city's loveliest neighborhoods. Our tour will include a private visit to one of the stunning mansions lining St. Paul Street and a walk through Louisiana Cemetery #2 where many historical figures were laid to rest. Then we will visit The Southern Food & Beverage Museum to learn more about Louisiana's unique culinary traditions, and dine at the affiliated Toup's restaurant. We will then have a chance to visit the boutiques and galleries that line Magazine Street, and choose to visit either the Ogden Museum of Southern Art, Confederate Museum or WWII Museum. From there, it's off to the legendary Preservation Hall, where we will have a chance to meet privately with director Ben Jaffe for some background on the venue's role in keeping New Orleans jazz traditions alive. Of course, we will be treated to a concert by this iconic ensemble. Dinner that night takes place at Antoine's, one of America's oldest and most beautiful restaurants. Once again, those who still have juice in their batteries are invited to join Jacob on an optional club crawl. This morning we walk to the nearby Court of Two Sisters for a jazz brunch in their lush garden. From there we head to The Presbytère Mardi Gras Museum, followed by a guided walking tour of the Treme neighborhood. We will explore this important cultural hotspot, including some of the sites featured in the hit HBO TV series, as well as pass by the Backstreet Museum and Treme's Petit Jazz Museum. After lunch at a local restaurant, we will travel back to the French Quarter by horse and carriage. Tonight's your chance for dinner on your own in one of New Orleans' countless restaurants, then feel free to meet up with Jacob for another optional pub crawl. After breakfast at the hotel we will walk to the Toulouse Street Warf and hop on the Steamboat Natchez for a Harbor Jazz Cruise. This historic paddle-wheel boat will take us past a number of riverside sites, and includes lunch and live music. Afterwards, we will visit the Historic New Orleans Collection, which offers a fascinating architectural overview. You'll have some time to explore on your own before we meet up at French Quarter bar B-Macs for a crawfish boil on their back patio accompanied by a private concert with the phenomenal Treme Brass Band. 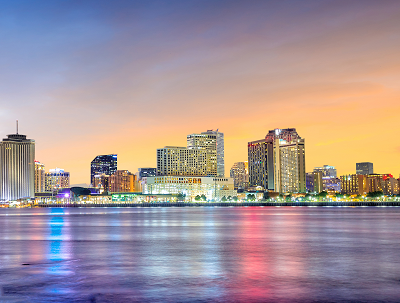 After breakfast at the hotel, you’ll bid farewell to New Orleans as you board your flight home. It’s been said that the French Quarter begins in the lobby of Hotel Monteleone. This venerable New Orleans hotel sits majestically at the foot of Royal Street and offers the best point of departure for all things New Orleans. Step outside and discover numerous specialty shops featuring art, jewelry, and antiquities from around the world. Discover quaint New Orleans restaurants which line the streets of the French Quarter. Just steps from the hotel are famous attractions including Jackson Square, Bourbon Street, the French Market, and the Riverwalk, where you can watch the steamboats along the Mississippi River. *Customary end-of-tour gratuities for guides, and tour leader are left to the guest’s discretion and should be based on your satisfaction with the level of service received. Trip-cancellation coverage available for an additional fee through Allianz. SINGLE SUPPLEMENT: For single-occupancy pricing, add $750.